There is no small irony in the fact that the most notable achievement of affordable housing policy in the United States over the past two decades has been the systematic demolition of affordable housing stock. To understand this upside-down world of housing politics, at least as it collides with the lives of the urban poor, we have to understand the moral panic that has developed around the concept of concentrated poverty. Over time, this panic has hardened into a consensus among the urban policy elite. For its members, most if not all social ills associated with cities and poverty stem from too many poor people being gathered in one place. As a result, poverty deconcentration has become the public policy hammer that defines as a nail virtually every problem related to urban inequality. And nowhere has this hammer been wielded to more devastating effect than against public housing. 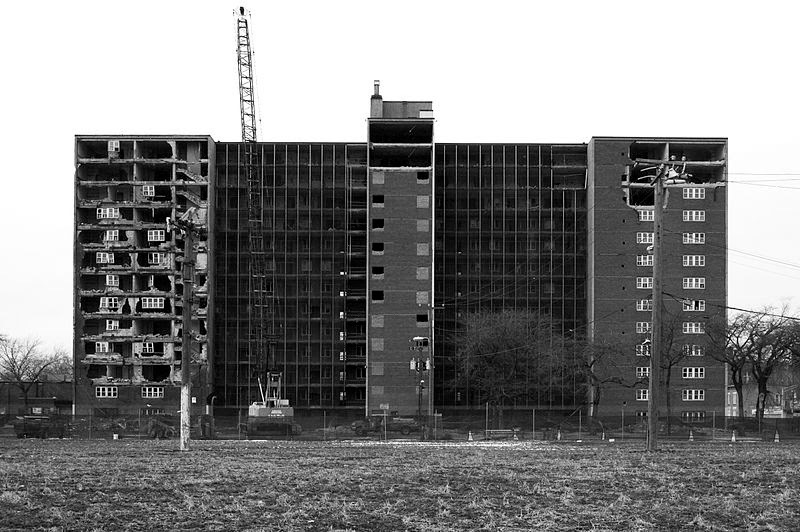 Public housing has long served as a convenient boogey man in debates about racial segregation and persistent, concentrated poverty in low income communities of color. It has been evoked repeatedly by conservative and liberal administrations over the past twenty-five years as they raced to dismantle the welfare state, achieving the status of conventional wisdom: "You don't think concentrated poverty is a problem? Just look at public housing!" Importantly, influential strands of academic research have provided intellectual firepower for the policy. As a highly racialized metaphor, "the projects" have a power to reshape the urban landscape that their residents can only dream about. Since the early 1990s, in city after city, the alleged failure of public housing as social policy facilitated demolition, even as the affordable housing situation for very low-income city residents grew ever more grim. Between 2000 and 2008 alone, over 99,000 public housing units were lost — a rate of 11,000 per year — primarily as a result of the HOPE VI program, a legacy of the first Clinton Administration. At the same time, the market forces that were nominally intended to make up for the destroyed housing units instead replaced the people they had once sheltered. This scorched-earth policy did not go completely unnoticed. In 2009, congressional representatives Barney Frank and Maxine Waters called for a moratorium on the demolition of public housing, referring to the losses as "epic." One year later, after a special mission to the US, the United Nations rapporteur on the right to housing repeated the call. 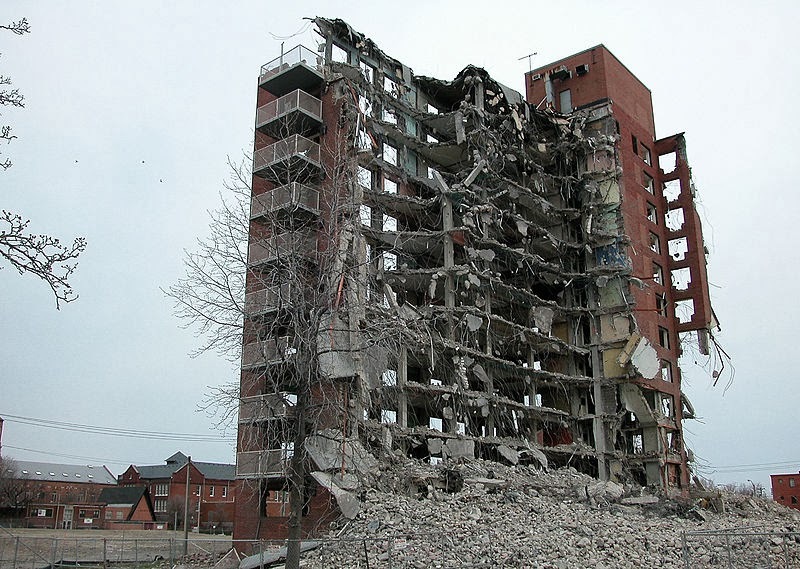 However, demolition continues and public housing projects have virtually disappeared in some cities. In Atlanta, for example, the last units were torn down in 2011. While the loss of actual housing for very low-income residents is the most obvious outcome of demolition, policies promoting deconcentration, mobility and mixed-income developments have a much broader impact. Tearing down public housing and dispersing its residents, for example, has broken up entire communities and cleared the way for widespread gentrification in many inner-city areas. After decades of research, the failure of these policies to alleviate poverty or even maintain existing levels of affordable housing is impossible to ignore. Yet the consensus around poverty concentration and, to a lesser extent, market solutions to urban poverty remains — apparently oblivious to the devastation for which it is responsible. The Right to the City report is unique because it involved residents of public housing from seven metropolitan regions in both the design and implementation of the research. The result is arguably the most comprehensive study we have of what public housing residents actually think about the places in which they live — or once lived. The picture that emerges challenges the widely circulated racist, sexist and classist stereotypes that underpin the myth of public housing as a policy failure. Against the view that public housing is the social and spatial epitome of an urban pathology, the report presents the views of residents who believe that public housing does and can continue to work, that repair and upgrading are preferable to demolition and that demolition destroys communities along with homes. It also argues that, to the extent public housing has fallen into disrepair, this is the result of decades-long neglect and disinvestment. The idea behind the special issue of Cities is to advance a debate about urban poverty and inequality that has grown stagnant, even as it continues to provide ideological cover for ineffective and destructive policy. While we hope it contributes to an effort to put deconcentration advocates on the defensive, our real interest is in simply leaving behind the distorted framework it offers and participating in the more vibrant intellectual and political work being done by researchers, community activists and others to address the intertwined challenges of displacement, poverty and political marginalization. Debates over the outcomes of deconcentration and mobility programs are important but, in our view, largely settled. Our introduction to the special issue of Cities refers to many related studies for those interested in exploring them in detail. We see deconcentration policies, however well intentioned, as expressions of austerity politics that convert homes and communities into real estate, driving former residents into a hostile and discriminatory market to individually chase "opportunity." We contrast this market-based mobility approach with a discussion of public housing and the right to place. Our focus is on what is lost when homes are torn down and people are displaced. This view is largely absent from elite discourse, which reduces complicated communities to the policy-ready concept of the concentrated poor. The relentless demonization of public housing and its residents over many decades has made it extremely difficult to even discuss the positive social, economic and political histories of public housing, much less its potential for the future as the affordable housing crisis grinds on. In the distorted view that has come to predominate, the role of public housing in anchoring social relations and political mobilization for low-income communities of color is erased. Articles in the special issue are part of an ongoing effort to reorient the research on poverty deconcentration toward the important history of public housing as a site of empowerment for people of color, especially for women. There is a relatively small but growing interest in crucial support networks that residents build over the years as a result, in part, of spatial concentration. From a research and policy perspective, these networks represent important challenges to the racist and dehumanizing rhetoric of "highrise hell holes" and other tired metaphors. Yet the centrality of public housing to these networks, and the consequences of its destruction, have elicited barely a whisper from deconcentration advocates in a rush to level the projects. Contributors to the issue also analyze how the ideology of concentrated poverty works to obscure the relationship between demolition and neoliberalism, particularly the partnership between market and state that has been so effective in clearing neighborhoods of existing residents in preparation for redevelopment. Authors here and elsewhere have argued that popular and academic discourses on concentrated poverty, opportunity and mobility are heirs of older "culture of poverty" arguments deployed by conservatives and liberals alike to dismantle social welfare policy. Today, critical studies of market fundamentalism and social inequality reveal the extent to which the spatial politics of contemporary cities represent what David Harvey calls "accumulation by dispossession." In this context, individualism, choice and mobility become mechanisms of dispossession that hinge to a great extent on dismantling stubborn concentrations of poverty — or what some might call poor and resilient communities. Rather than attempting to strengthen these communities, dispersion policies scatter their members to other poor inner-city areas or to increasingly race- and class-diverse suburbs. Poverty and segregation are not reduced, but are rendered less visible from certain social and spatial vantage points. In the end, a fresh view of public housing demolition and the deconcentration of poverty suggests that these policies do not create opportunities for the urban poor. Instead, they represent new cycles of accumulation and attempted management of resulting inequalities. From social and political perspectives, poverty deconcentration functions primarily as a form of disorganization, making it much more difficult for low-income people to collectively mobilize. Rather than increasing the upward mobility of marginalized communities, it decreases their ability to assert a right to place. Tony Roshan Samara is an associate professor of sociology at George Mason University. He also chairs the Cities and Globalization Working Group and serves on the national steering committee of the Right to the City alliance. Tony welcomes correspondence via Twitter (@CGWG2) or email (samar495@gmail.com), and many of his publications can be downloaded free of charge at Academia.edu. Very important points here, notably the connection between withdrawal of funding for housing management and the rise of crime and urban blight, also the way deconcentration hinders collective political mobilization. But can we as a society afford, from a budgetary perspective, to better manage affordable urban housing? Well, easy for any of the above-noted academics to talk about the number of angels that can dance on the head of a pin. It is, however, a different story when the culture of gun-fire-toting-run-amok culture of public housing projects threatens your life daily. I abor these hell-holes because I live near several inter-generational, poverty-promoting dependent public housing projects, and their gun fire and gun brandishing have both, "knocked down a pregnant neighbor of mine" as well as "placed holes with 10-rounds of bullets in my neighbor's door. Please get out of your ivory tower, demolish this "culture of ignorance and gun activity that threatens my life", then, you can might gain some credibility. I see what you're saying and I respect the hard conditions you're up against, but public housing projects don't brandish guns; ineffective law enforcement and spatial separation makes it possible for people to get away with it in these areas but not in others. I think one of the key points here is that affordable housing communities deserve the same quality of services that other places receive so that you and your neighbors and the majority of people in the projects who don't tote guns can live in safety and health. ...and relocating people from inner cities isn't necessarily to their advantage, often making their lives more difficult as their former neighborhoods gentrify. also, higher income communities are not immune from gun violence. Highrise buildings in many parts of the world are very safe, basically pleasant places to live. But like any community they require good governance. Your analysis of ongoing processes to eliminate social housing in American cities is indeed revealing. What cannot be read from it, however, is a vision of what new low-threshold housing should be like under contemporary post-Fordist conditions. In continental Europe the demolition of public housing is not a widespread phenomenon, as public housing tenants are highly protected and the redevelopment of estates is a tiresome, piecemeal process. In countries historically committed to the idea of social housing (such as my country, Austria) the core issue is rather how to locate and design new subsidised housing. Nobody wants to have the modernist satellite cities and mono-functional estates back, but alternative typologies are not available. On conversion sites and in infill development many nice projects occur, but - given high land costs - they again end up servicing the urban middle class, while the poor - recent migrants, the unemployed - have to resort to the private rental market. I have the impression that the intellectual advocacy for low-threshold housing does not reach beyond the conservation of the existing stock.